Today i am going to share our experience of tacking and scaling the peaks of Donga gali to Ayubia and Mushkpuri top. We made a quick decision of traveling and i did not foreseen the post regarding this travel or would have clicked some better pictures. However i hope you enjoy this post while i will try to mention the basic details for any one who want to spent few days on mountains. We traveled from Lahore to Abbottabad to start our trip towards Nathia gali. You can choose to travel from Isalmabed to Natihia gali via Murree and Ayubia but let me tell you the view from Abottabad to Nathia gali is breath taking and you wouldn't want to miss it. We travlled to Nathia gali after dusk so there was not enough light for pictures and i want to enjoy the view as much as i can. We had reserved rooms in Nathia gali from Lahore and the accommodation was very good considering the payment we were offered. With good sleeping arrangement and hot water to wash we enjoyed our stay very much. If any one want to know the particular details then i will be glad to help. 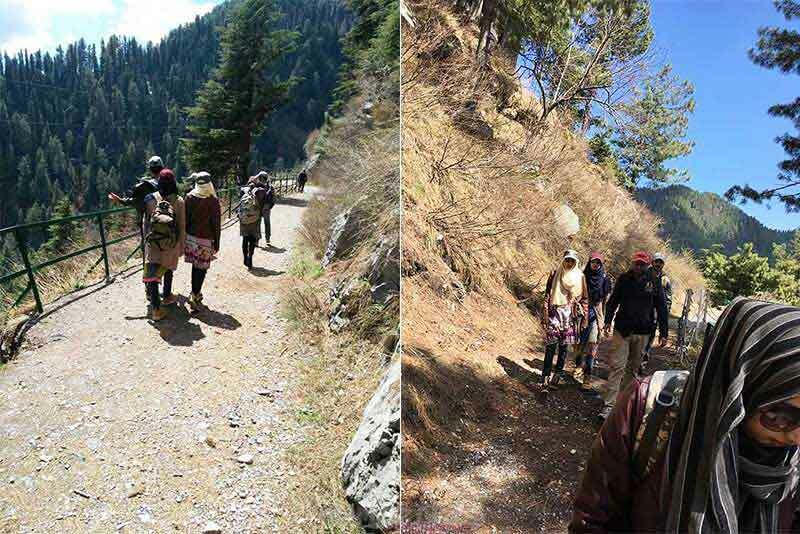 On first day we spent our day tracking from Donga gali to Ayubia. 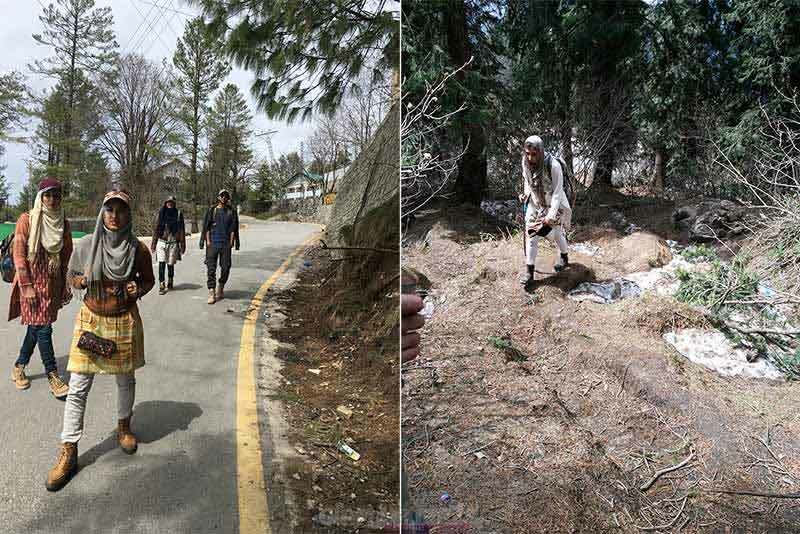 You can either walk to Donga gali or can get any local van to reach there. 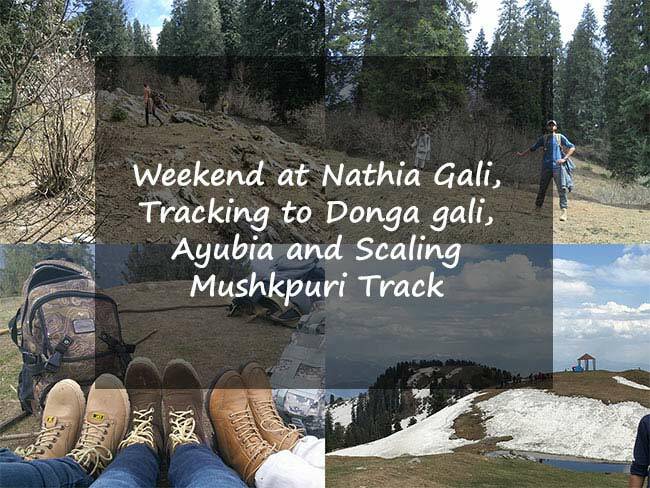 From Donga gali you will track 4km pipline track towards Ayubia. This track is pretty easy to walk and if you don't have much experience traveling through mountains you can test your limits here before considering scaling to Mushkpuri top. Track is very much straight forward and there are only few points where you will face the slope upwards. The view you will witness is beautiful and you would see the valley swarmed in pines. Ayubia is a beautiful place on its own. Upon reaching you can find many restaurants and very reasonable bazar which was shocking considering how far they bring the items to sell. I have posted our Jewelry haul form Ayubia. There is also chair lift adventure to a lovely spot where you can enjoy refreshment or have pictures on peak. The trip back can be done by same tracking route or you can opt for any serving van to get back to Nathia gali. Second day we decided to scale the route to Mushpuri Top. This route is also 4km but it is far from easy specially if you have melting snow patches and have no experience in hiking. We have lived our lives in Quetta but spending few years in Lahore had made us soft for such adventure. Nonetheless it was amazing and after taking some rest on some spots we managed to climb the top in 2 and half hour. On top you will find a wast meadow if you call it and the view down was some thing we cherished as our accomplishment. You can find some locals to provide you with horse ride if you cannot climb up or down but thankfully we were managed to do the deed on our own. It was an amazing weekend we spent and loved our stay on mountains with full of nature. We traveled back via Muree and Islamabad to enjoy more of beautiful views. I would suggest every one who want a break in busy life to go and explore the nature. I hope you enjoyed the post. Let me know do you like hiking/scaling and which spot is your favorite?